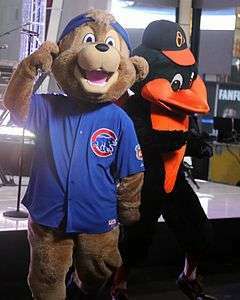 According to the various stories "The mascot also will greet fans at Wrigley Field before and during games, as well as assist kids in running the bases on Family Sundays. Families can visit Clark's Clubhouse at Wrigley." 1 2 3 4 "Cubs introduce new mascot". ESPN. January 14, 2014. Retrieved March 14, 2014. ↑ Muskat, Carrie (January 13, 2014). "Unbearably cute! Cubs unveil new mascot: 'Clark' makes debut Monday night, will focus on supporting kids and families". MLB.com. Retrieved March 14, 2014. 1 2 3 Gonzales, Mark (January 13, 2014). "Cubs unveil Clark the Cub, their first mascot". Chicago Tribune. Retrieved March 14, 2014. 1 2 Snyder, Matt (January 13, 2014). "Cubs announce new mascot, Clark, a 'young, friendly cub'". CBS Sports. Retrieved March 14, 2014.